The Daily Caller News Foundation has obtained drafts of a plea agreement and a statement of criminal offense that special counsel Robert Mueller prepared for Jerome Corsi, an associate of Roger Stone’s. The documents show that Mueller’s team wanted Corsi to plead guilty to making false statements about three email exchanges he had with Stone regarding WikiLeaks. One of the emails shows that Corsi told Stone on Aug. 2, 2016, that WikiLeaks founder Julian Assange was planning to dump Clinton-related emails. Corsi rejected the plea offer. Special counsel Robert Mueller cited three email exchanges between right-wing author Jerome Corsi and Trump confidant Roger Stone in a draft court filing submitted to Corsi earlier this month. The emails show that in late July 2016, Stone suggested that Corsi or one of his associates get in touch with WikiLeaks founder Julian Assange. Another email, from Aug. 2, 2016, shows that Corsi suggested to Stone that he knew of WikiLeaks’ plans to release information that would damage the Clinton campaign. Corsi also referred to “hackers” and Clinton campaign chairman John Podesta in the email. The emails are laid out in a statement of offense that Mueller’s team prepared as part of a plea agreement offered to Corsi. Corsi, who has a joint defense agreement with President Donald Trump, has appeared twice before a grand jury hearing the case. He has met with prosecutors six times for more than 40 hours. The sticking point between Corsi and the special counsel appears to be over whether he had a source who tipped him off to WikiLeaks’ plans to release emails stolen from Podesta. WikiLeaks began dumping the documents on Oct. 7, 2016. Corsi claims he did not have a WikiLeaks source. Rather, he insisted to prosecutors that he predicted in August 2016 that WikiLeaks had Podesta’s emails and would begin releasing them in October. In their statement of offense, prosecutors said that Corsi lied when he claimed that he rebuffed Stone’s request to reach out to Assange. They also alleged that Corsi lied when he denied providing Stone with any information about WikiLeaks’ plans to release documents. Corsi also lied by denying that he asked another person — a London-based academic named Ted Malloch — to reach out to Assange, prosecutors alleged. Corsi announced on Monday that he was rejecting the plea offer. He claims that he did not knowingly lie to prosecutors, who he accuses of setting him up for a perjury trap. “I will not sign a plea agreement that is a lie — I never ‘willfully and knowingly’ gave false information to the FBI or the Special Counsel,” Corsi wrote in a memo he sent to his attorney, David Gray. Corsi provided copies of the plea proposal and draft of the statement of offense to The Daily Caller News Foundation and other news outlets. He also shared a limited immunity agreement he signed with prosecutors for portions of his Sept. 21 testimony before a federal grand jury in Washington, D.C.
“Word is friend in embassy plans 2 more dumps,” Corsi wrote in the Aug. 2, 2016, email to Stone, seemingly referencing Assange, who lives under asylum in the Ecuadorean embassy in London. Corsi said prosecutors pressed him repeatedly about the wording of his email. Stone, who provided the Aug. 2 email to TheDCNF, said that the document does not show that he knew that Podesta’s emails had been stolen. Stone has said that he had only one confirming source — activist Randy Credico — for information about WikiLeaks’ plans. Stone has released text messages that show that Credico provided him insight into WikiLeaks’ plans to release information that would “roil” the Clinton campaign. “Julian Assange has kryptonite on Hillary,” Credico wrote in a text message on Aug. 27, 2016. Stone insists that he did not know that WikiLeaks would release Podesta’s emails. He also denies ever meeting or speaking with Assange. But emails cited by the Mueller team show that Stone did push associates for meetings with the WikiLeaks founder. Corsi forwarded the email to Malloch, a conservative who sought a position in the Trump campaign. There has been no evidence yet that Malloch met with Assange. He was interviewed by the FBI in March. Stone told TheDCNF that he offered three suggestions to utilize Malloch to help the campaign: secure a meeting with Assange; meet with Bernie Sanders’ brother, who resides in the U.K.; and investigate Bill Clinton’s activities as a student at Oxford. Stone’s July 25, 2016, email to Corsi followed hours after Stone received an email forwarded from Fox News reporter James Rosen. “Am told Wikileaks will be doing a massive dump of HRC emails relating to the CF in September,” Rosen wrote in an email to Charles Ortel, an associate of Stone and Corsi’s. On Aug. 8, 2016, Stone claimed he had been in contact with Assange and that WikiLeaks was planning to release Clinton Foundation documents. “I actually have communicated with Assange. 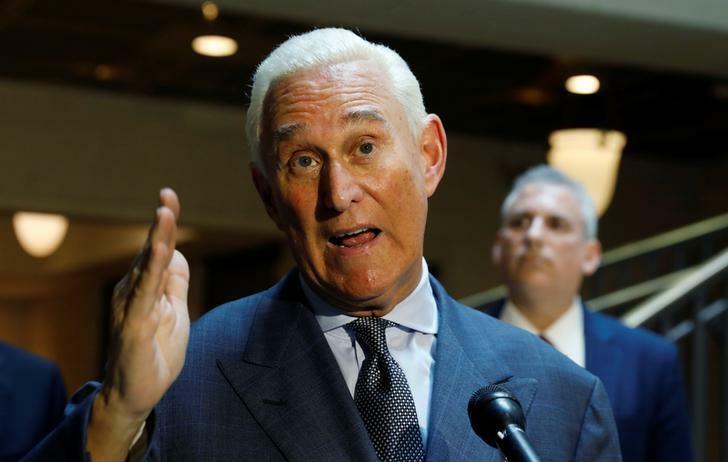 I believe the next tranche of his documents pertain to the Clinton Foundation but there’s no telling what the October surprise may be,” Stone told a group of Florida Republicans. Stone has since denied communicating with Assange, saying that he was exaggerating that he had a back channel — who he later identified as Credico — to WikiLeaks.